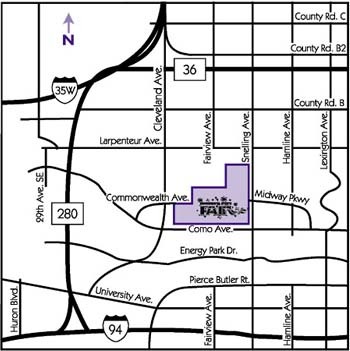 The Minnesota State Fairgrounds location is 1265 North Snelling Ave. in St. Paul. From the north: Take 35W south to Highway 36 east via Cleveland Avenue Exit on Snelling Avenue South. From the south: Take 35W north to I-94 east. Exit on Snelling Ave., then turn left and head north. Or take 35E north to I-94 west. Exit on Snelling Avenue, then turn right and head north. From the east: Take I-94 west to Snelling Avenue, then turn right and head north. From the west: Take I-94 east to Snelling Avenue, then turn left and head north.